I dont even realized that until I saw a message on my FB page.. Barely Supermommy is ONE today!! Thank you for all your support, opinions, experiences that you have shared together with me on this page. It’s really a new journey for me on being a mom and personally I think it’s good to share with other mommies out there the ups and downs of motherhood. So, yay!! Cheers to many more happy years together!! What am I up to nowadays? We are moving out in a few days time. We just thought we need a slightly bigger place for us and the coming baby.. So, our house is really looking like a tongkang pecah right now.. I’m a bit emo leaving our current place coz this is our first house together. We moved in almost two years ago with only our own luggages, slowly we bought furnitures together… Haaa.. so sentimental.. all the fights and hardwork fixing IKEA furnitures.. Hahahha.. 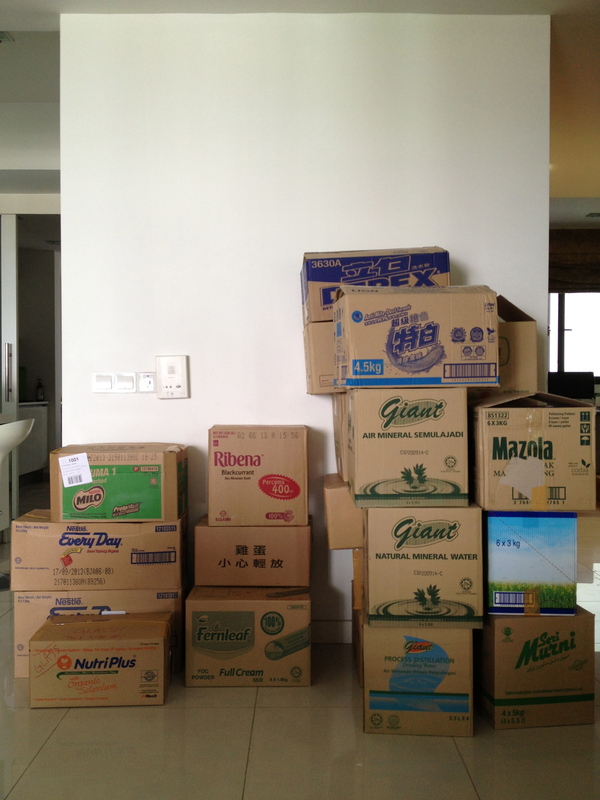 This is the most organized mess in the house.. boxes from supermarket!! And that’s B, joyful as ever.. busy playing hide and seek behind those boxes..
Posted on September 24, 2012 by Dr Halina Mohd YunosPosted in WhateverTagged whatever. Previous Previous post: Latest Craving..
Memang penat pindah rumah…baru je rasa hari tu, by the way congrats to barely supermommy! Comel B! Take good care dr. esp. yang kat dalam tu… so tiring bila pindah randah ni.. Happy Bestday to Barelysupermommy. I love reading Your blog. Inspired me as I’m a mom to my beloved little toddler Hannah Inarah. Thank u Dr.
New member = bigger space. Take care! ur moving out from the zehn?! the house r u going to rent or what? but the best thing can live together with very own family n very own house… how can time past by… hope like u or others that can live in very OWN house… with private places..
very fun and enjoy…l like read this blog..congrate Dr.Halina..
even I don’t married yet.but I really enjoy to read this blog and waiting for new entries everyday…keep on writing dr halina… u hve inspired me to be a good mom at the future..
congrats Lina. Already 1 year. Keep on writing. Take extra gud care of yours. alahai..so cute B’ s smile. Doc, muka Bella same like you hehehhe.. Awesome! Your lil one is growing nicely too. Always following barelysupermommy’s adventures. Me and my lil one just started blogging too. I love the way you write each entry…simple and sometimes knowledgeable. You make me always wait for your new entry…congrats doc!!! Congrats doc!! i’m really proud of you….